Stanley was a troublesome engine who came to the Mid Sodor Railway from the United States. He was soon deemed useless as a locomotive, and was turned into a pumping engine instead! With the original base models from Skipper1945, engines City of Truro and Neville are now available. More 'Sodor' modified engines are soon to follow. Celebrating 70 years of 'The Railway Series' comes a gold-painted Thomas, based on the classic Wooden Railway model. A fictional coach and brake van set addition for the narrow gauge 'Ghost Engine'. Years ago, a little narrow gauge engine was travelling home, when he suddenly derailed, and fell from the side of an old iron bridge. To this day, it is rumored that his spirit still haunts the crossing. In the last story of The Three Railway Engines, Henry is given a lovely new coat of blue paint, and retains the livery until Troublesome Engines. 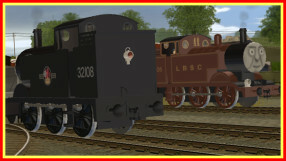 In keeping with the style of the classic SI3D 2006 models, Henry's scheme is unweathered. Four saddle tanks that still shine to this day on the Ffestiniog Railway in Wales - Princess, Prince, Palmerston, and Welsh Pony. Silver is a narrow guage engine that once boasted about being 'the fastest engine in the hills'. One day, a wizard grew fed up with Silver's bragging, and promptly turned him into a rusty, slow engine named Tramp, who was soon mocked by the others. The Flying Thistle is an engine that visited Sodor. When he arrived, he was first seen by Percy, and later, thought to be Gordon by Bill and Ben. The link to the Series 3 Coaches has been fixed. Palmerston, Prince, and Sir Haydn have been removed from the site for much needed updates. 'Tickled Pink' James has recieved a cosmetic update, featuring new faces and paintwork. A stripped version of James without his paintwork has also been included, sporting both CGI & model faces. Sixteen was a troublesome engine who lived at a steelworks with other engines. One day, he slid past a warning sign and ended up "Cab Over Wheels" down a hill. Afterwards, he was sent to a preservation line. Today sees an update of the original RWS Skarloey engines pack. All seven engines have been updated with with new red and weathered paintwork, and new whistlesounds as well. Today sees a complete overhaul of another model, an updated version of Furness Railway Edward, which was also the very first model release from the days at North Western Railway 3D. More updates of older models - first off, 'The Red Engine', seen in The Railway Series books, The Three Railway Engines and Henry the Green Engine. Next up, an update of Proteus, the legendary 'magic lamp' engine, now available in numbered and non-numbered form. Next, a new 98462 pack has been released, containing three varations of engine (98462, unnumbered, and Alfred), and two variations of its tender (numbered and unnumbered). All models feature all new updates, including updated paintwork, whistles, and sounds. In the two years since the original A0 Pacific pack was released, it has gone through two previous updates. Today, the 4th and finalized version of the pack is released, utilizing all new textures and updates. Albert, the Mid Sodor Railway engine, in the style of his MKII style as seen on The Rev. Wilbert Awdry's layout, is released. Rheneas is released in his blue-lined yellow livery, as seen in the upcoming film, Blue Mountain Mystery. 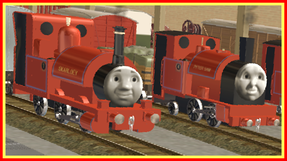 A project that I (originally) began about 10 months ago, the Skarloey Railway engines, in their livery featured troughout The Railway Series. The pack features engines No. 1 - 6 and No. 8. Also, the Billinton LB&SCR liveried E2 has been updated with proper paintwork, going to more of an umber colour, rather than red. I've completed my move here to Northwestern Railways, the new home for my old and future projects. Full details of the switch will emerge on SI3D Forums over the next few days. In the mean time, I've transferred my original models over here, so they're still available for download.